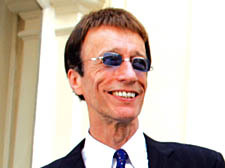 HEAVYWEIGHT musical figures including Jarvis Cocker, Jazzie B and Robin Gibb from The Bee Gees have joined forces to back plans to create a Walk of Fame on the main streets of Camden Town. The idea to lay a heritage trail is largely the brainchild of club impresario Lee Bennett and would see a series of slabs dug into the pavements to credit the famous names who have passed through the legendary music venues in Camden Town – just like the “stars” that line Hollywood Boulevard. Mr Gibb was speaking to film-maker Nick Mason, who has captured a series of celebrity endorsements on camera. The New Journal was given a special sneak preview of the film. One clip shows Soul II Soul star Jazzie B raving about Camden Town. Other bands said the area became so synonymous with good music that there were sometimes more record company executives than fans in the crowds at clubs like the Dublin Castle, Barfly and the Electric Ballroom. The Dub Pistols described Camden as an “A & R man’s dream” while The Cribs and the New Young Pony Club recalled how they were both signed after doing one gig in the area. Others proved their fondness for heady party days by... not remembering them. Jarvis Cocker said: “I can’t exactly recall... Camden in the Britpop era... erm...”, before a five-second pause. He did remember a gig at the Underworld around 1992, when Suede supported his then-fledgling band Pulp. “A week later they were massively more famous than us,” Mr Cocker added. A committee meeting is due to be held in the next weeks to discuss the progress of the project.